Victorian-era furniture is so yesterday. The opulent sofas, sideboards and buffets once synonymous with the antiques market are old news, supplanted by the streamlined, function-over-form Danish modern aesthetic that characterized mid-20th century design. It's a shift symbolic of a larger evolution in the segment, with a new generation of buyers and sellers ignoring tradition and gravitating to the pop culture ephemera and baby-boomer nostalgia of the recent past. "Everything is different now. So much is worth so much less than it used to be," says antiques expert Terry Kovel. "Styles and tastes have changed." That transformation of the antiques and collectibles segment corresponds with an influx of new full-time and part-time sellers. Online marketplaces like eBay and Etsy offer established digital channels for fledgling dealers to reach customers across the globe. Antiques shows, flea markets and church bazaars present opportunities to interact with collectors up close without paying rent on a retail space. The recession is also playing a significant role: FleaMarketZone.com reports more than 115 new flea markets and swap meets have opened in the U.S. in the last year alone, many in dirt-cheap commercial spaces like shuttered shopping malls and bankrupt big-box retail stores. 1. Study the market. "Every dealer started selling out of a pushcart, so to speak," Kovel says. "Go everywhere people are buying and selling antiques, and see what's selling and what isn't. It's how you learn what you're doing and what you should be looking for." 2. Understand the logistics. "It takes a long time to find something, and from there, you have to clean it, restore it and store it," Kovel says. "Once you sell it, you might have to pack it, ship it and insure it. It's also getting more difficult to make money online. EBay rules and fees are killing the market." 3. Buy and sell what you like. "We're not schooled. 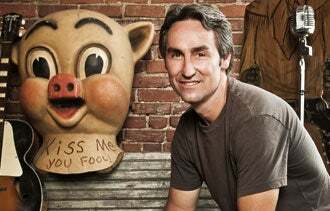 We don't have degrees," says Mike Wolfe, owner of Antique Archaeology and star of History channel's American Pickers. "If you took 10 pickers and put 'em in a barn, they're going to come out with 10 different things they think are cool. When you walk into someone's shop, you're gonna get an idea of what we think is awesome." 4. Be honest, and be fair. "I can't tell you how many people I've picked have turned me on to other people to pick," Wolfe says. "I don't care if you're selling aluminum siding or gummy bears. If people don't like you, they're not gonna do business with you."